#winestudio originally was the result when ingenuity and necessity collided. Today, #winestudio has evolved into a wine education and grassroots marketing program produced by Tina Morey. Its message is interactive wine education, thus a better understanding of our world through wine and our part in that world. If interested in having your brand on the program please click here for more information. Super easy! The online "conversation" is organized on the Twitter platform. Sign up for a Twitter account then type the hashtag #winestudio in the search bar. This is the #winestudio "conversation." Follow along, reply and tweet to the group! #winestudio is a collaboration of writers, sommeliers and industry professionals who love the wine and beverage industry. #winestudio is produced by Tina Morey, Certified Sommelier who's been in the food and wine industry for over twenty years. ​Tina is a hero and a genius. "Working with #winestudio was a fantastic experience for us! Sessions were insightful, energetic, and exciting, and the timeline of four consecutive weeks allowed us to dig deep into meaningful discussions with knowledgeable people. Above all, we appreciated Tina's efficiency and detail oriented work, which set us up to achieve our goals...and then some!" "Tina is a hero and a genius. She works with producers (domestic and international) in a way that combines marketing and wine education into a program that is (1) really fun, and (2) legitimately educational, and in a way that maintains integrity–she has a knack for finding wines for the group that are of impressive quality, so the group’s enthusiasm for the wines we talk about is authentic." "It’s hard to describe #winestudio as just one thing. If you think about a complex machine with many moving parts, operated by a skilled technician, you’ll come close to understanding its essence. Tina Morey brings together people from all walks of wine: growers, distributors, sommeliers, and enthusiasts attend her virtual salon each Tuesday night to discuss every aspect of making, selling, and enjoying wine. Participating in #winestudio over the past year has expanded my wine education far beyond what’s in the books. Listening to a winemaker explain the challenges of vineyard variation makes me appreciate what’s in my glass that much more. And interacting with fellow participants around the world has widened my perspective on what wine is all about. Whether you’re in the wine business or just want to learn more about what’s in your glass, #winestudio is a high-powered way to significantly “up” your wine game." 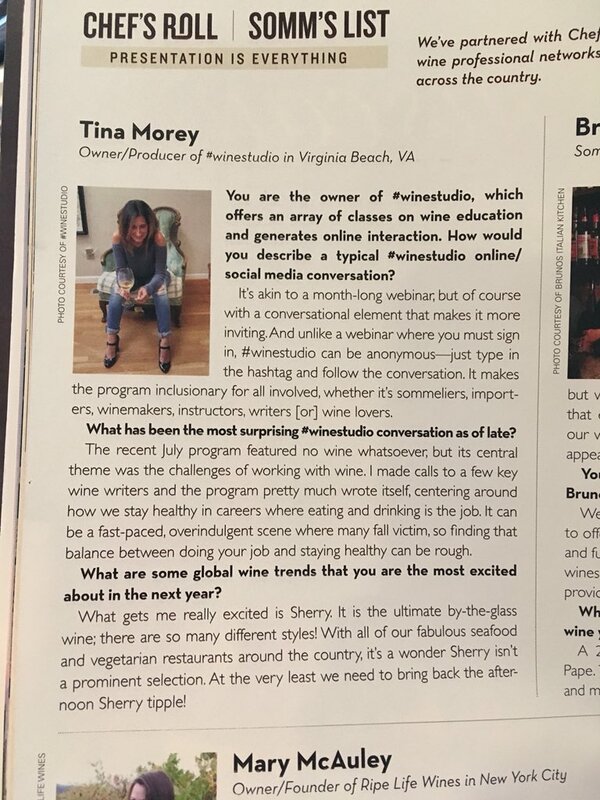 "[Tina] is one of the most authentic, creative, 'real' people I deal with in the wine world, and the #winestudio community a priceless addition to my life." "I've found #winestudio to be a great opportunity to learn about wine from different regions and is a great source for articles." Regular participant in the #winestudio education and marketing program. Since 2015, received wines from all over the world to sample and discuss weekly during Tuesday night Twitter discussions. The program has afforded me the opportunity to immerse myself in wines from regions in Italy, Spain, United States, France and Argentina while taking deep dives into Albarino from Rias Baixas, Prosecco Superiore from Conegliano Valdobiaddene in the Veneto, and Super Tuscans from Bolgheri in Tuscany. The discussions include in-depth chats with other wine professionals, winemakers, marketers and public relations professionals. re: Why I contacted you. 1. I consider you a friend. I recall when we first spoke in Virginia at wbc11. At the airport on the last day. You agreed with my comments about writing only positive things about wine and wineries. Great first impression. 2. Then our pre-conference tour in Oregon. And of course all the wines you have shared via #winestudio and previously via #winechat. And the cigar you shared. 3. I have the feeling that we share something in common. An adoration of good wine, food, people, their stories, friends and family. Wine is our center, part of our culture. Sharing what we know and love is second nature. 4. Not getting too specific. I trust and respect you. You have always come across as a "straight shooter" as positive, direct, and enthusiastic. And all those wines we have shared together, the flow of words on twitter, the Q&A and your natural passion and curiosity. It feels like a bond. And our ages are not too far apart. So there's that too. Please fill out your information to find out more about #winestudio. In the comments section please mention if there is a particular program with which you'd like to participate.